We are so confident that you will be pleased with our premium product that if, for whatever reason, you do not absolutely love it, just contact us, we will refund your FULL purchase or get a brand new replacement! 2. Special groove design is able to hold the pot lids steadily in place. 3. Two ways of placement, designed for placing in a vertical or horizontal way at anywhere you like. 4. Freely remove any layer of shelf to change different compartments height. 5. Features 3 slots at the second layer that you can minor adjust the compartments space. 6. Allowed to be secured to a fixed position by 4 parts, hardware included. Material:100% made of THICKENED iron wire with non-scratch coating. Pan organizer and pot lid or cutting board organizer Just purchase two of our organizers. Click Add to Cart and eliminate kitchen clutter today! 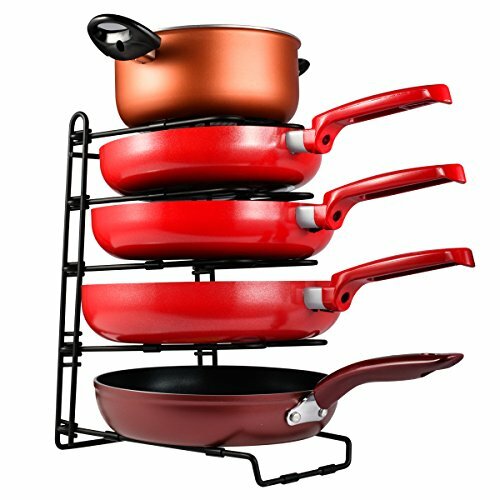 Effortlessly stack up to 5 pots, pans, griddles and lids (8-12 inch). Stacking and adjustable compartments height design creates additional storage in your kitchen to maximize countertop and cabinet space. Placed horizonally or vertically accroding to your needs.While being used vertically, the upward tilt design prevents the slipping of the pan,while being used horizonally, the special groove design is able to hold the pot lids steadily in place. Pan organizer made by heavy duty THICKENED iron, more durable and holds heavy weight cookwares without shape change. Premium black non-slip coating makes it easy to clean and protects your pans from scratching each other. According to the thickness of the pot, you can freely remove any layer of shelf to change a larger compartments space. Features 3 slots at the second layer that you can also minor adjust the compartments height. Dimenmsion:14.8" x 8.9" x 10.6". Adjustable compartments height: 2.56'' to 3.15'' to 6.4". Fixed mounting to accomodate your different need. Allowed to be secured to a fixed position by 4 parts,hardware included. If you have any questions about this product by SHMEIQI, contact us by completing and submitting the form below. If you are looking for a specif part number, please include it with your message.